180PCS Nylon Hex Spacers/ Screws/ Nuts Assorted Kit. Multifunction: The Assortment Come with Nylon Hex Spacers, Screw, Nut, Stand-off , applies to many area. There are 3 Millimeter bouth size come with beautiful single plastic box. Premium Quality: All products are made of durable nylon, Strong, anticorrosive, compact and portable. 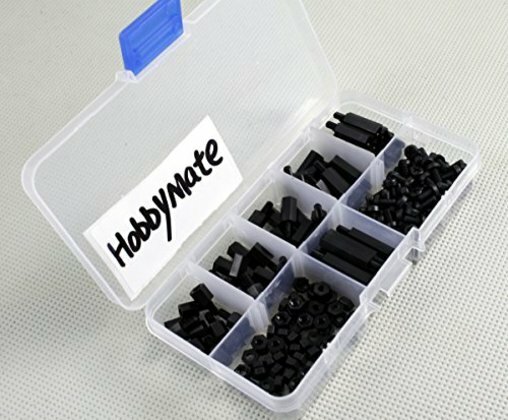 What You Get: 180pcs Black M3 Nylon Hex Spacers Screw Nut Assortment, and our 18-month warranty and friendly customer service.